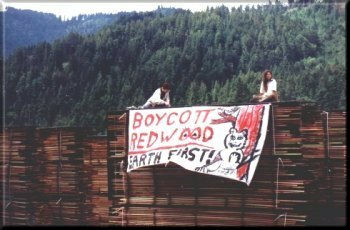 Rainforest Action Network and Greenpeace have called for a boycott of all old growth redwood. Home Depot, along with 100's of other lumber yards annuonced this May '97 that they would not longer stock lumber made from ancient redwood trees. Call your local lumber yard today and encourage them to follow Home Depot's excellent example if they haven't already! Before you buy any more lumber, check out RAN's Alternatives to Redwoods web page.